There are very few books that have touched me. And The Book Thief is one of them. The book is narrated by "Death." And it's bound to make you cry. In a small town in Nazi Germany lives a girl, Liesel Meminger, having a mysterious past, who finds a new home and foster parents, the Hubermanns, at Himmel Street, Munich. She lives with a Jew-lover foster-father and a cardboard-faced foster mother. 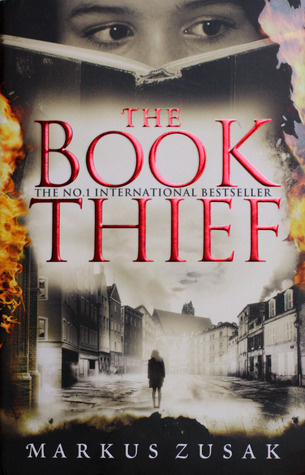 And it needs no guessing that Liesel is the book thief. I really liked the way the narrator kept throwing hints here and there of what might happen to the characters later on. Everything goes fine with Liesel's family until his father has to give refuge to a Jew, for the sake of an old promise. This turns out to be a risky business. The book tells us about the dilemmas of German families during the WWII. There sufferings, however, are less than those of the Jews in Nazi Germany. Honestly, it was very difficult for me to picture Liesel's mother described in the book as having a "cardboard face and a wardrobe body." My favorite characters were Rudy and Max. Rudy is Liesel's neighbor and best friend (you'll love that boy), and Max is the Jew hiding in Hubermanns' basement. There are some lovely parts in the book, like when Max writes a book for Liesel to read, and Liesel's numerous adventures with Rudy. And then, of course, there are other heart-breaking parts, like when Max has to leave the Hubermanns and the bombings that decide everyone's fate. My sister forced this book in my hands, and as soon as I found out it was about Nazi Germany I got curious about it. I read this book a little while ago, so I may have forgotten a couple of things which I wanted to say about the book. There are a few questions one would ponder after finishing the book, like who did Liesel marry when she grew up? What happened to Max? etc. Spoiler alert: The irony is that Liesel lost her own parents and than her foster parents too. "He does something to me, that boy. Every time. It’s his only detriment. He steps on my heart. He makes me cry."